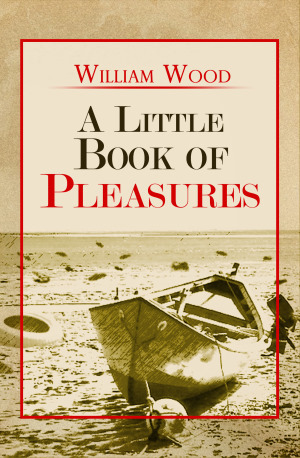 A Little Book of Pleasures by William Wood is a delightful anecdotal collection about life's little pleasures! In these days of 24 hour news many of us may feel smothered under an avalanche of anxiety, despondency or at best choking with rage over national and world events. Grand passions apart, however, there is still much to enjoy. The small pleasures of life lie all around us. They might be found in a state of mind, in the touch of a familiar object such as a favourite wooden spoon, or they may be found in fleeting observations: a baby's smile, the sudden appearance of a stag in your path; or they may be physical pleasures like sucking the wet flesh of a ripe mango or the aroma of coffee spilling out on to the pavement on a cold morning. In a mad and greedy world it is these small pleasures that keep us sane, and dare we admit it, happy. Told with wry humour and a gentle, sometimes quirky style slightly reminiscent of a bygone era, Wood's collection contains a mixture of description and observation with a smattering of autobiographical incident. Wood has lived in many places of the world, is well travelled and well read, with a keen sense of enjoyment in what he sees and experiences, and a talent for bringing that visually to the mind of his reader. The short, usually self-contained pieces make wonderful cameos both for those who do their reading in snatches, and those who will want to devour his stories in one sitting. William Wood has led a nomadic life and his friends and relatives are far flung. He now lives and writes in Sussex when he is not visiting his children in France, Rutland and Cumbria or his in-laws in Norway and Slovakia. The diaries he keeps on these visits occasionally give him local colour and ideas for his stories. His short stories have been read on the BBC World Service and included in a number of magazines and anthologies. His first published novel, No Time, was brought out by Babesh/Ryan in 2003 and his next novel, Passing Wind has been shortlisted for an Amazon prize. 1) Can you describe A Little Book of Pleasures in a short sentence? It is a book about the small pleasures of life. 2) What inspired you to write about life's little pleasures? I read the Philippe Delerme's best seller. La Premiere Gorgee de Biere (the first mouthful of beer) and it made me think of the small pleasures of my own life. I began to write them down and after a few years had enough for a book. 3) Which is your favourite out of all the life's little pleasures you have written about in A Little Book of Pleasures? They are very different and some are very personal. We take pleasure in familiar objects, such as a fountain pen not so often used any more, or a place such as a particular Norwegian log cabin, or a state of nature or state of mind. As a migraineur I am always happy when I wake free of a headache. I do not think I have a favourite. 4) You have travelled to many places around the world. What is the most important thing you have learnt from your travels? That to get under the skin of a place you should at least make an attempt to learn the language and the culture. Short term tourism, however well earned by the holiday makers, can be damaging to both sides. 5) What do you hope readers take away after reading A Little Book of Pleasures? A sense of enjoyment and perhaps a re-discovery of their own pleasures. 6) Can you tell us about your other published work? I have written stories since the age of 5. At university I put on my own plays, now long lost, I wrote a novel in Australia when I should have been doing a PhD. but never submitted it for publication. I have had short stories read on the BBC World Service, have had many published in the small press and three volumes published by Green Arrow Publishing. Sometimes I get included in prize-winning anthologies, usually as a runner-up. Earlvworks Press has several of my stories in their various publications and I can recommend that publisher. It is a similar story for poetry, though I take my prose more seriously. My first published novel was No Time, published by Babash/Ryan, but the publisher disappeared without trace and with it my novel. My next novel. Passing Wind I would dearly like to re write, but will probably concentrate on something quite new. 7) How do you like to write? Pen or keyboard? Spontaneously or planned? Bit of each. First drafts are always written by hand. That is the hard bit. Once I type it up and in recent years thanks to word processing, the rewrite and changes are a pleasure. The hard work is over and putting it in shape is a different kind of activity. If it is a poem or a short story it is spontaneous, but if I do not finish the piece ie work at it every day until it is finished, it will never be completed. For a novel you need to work at it like any other full time job. 9) How did you feel when you first saw A Little Book of Pleasures in book form? 10) There is a sequence of quotes playing on your website. Do you have a favourite and why do you like it best? "Who speaks is not who writes ..Who writes is not who is." Roland Barthes. I find this so true. Even if we write an autobiography it is a kind of fiction. In answering these questions I am not the same person who wrote the book. 11) What is your opinion on e-books? Living in a small house which is being taken over by books, I think it must be a good thing. I do not know if the authors get paid as much for sale of ebooks. Do they? 12) What do you do when you're not writing? For the last three years I have been a full time carer for my 91 year old parents. That is more than a full time job. I also have grandchildren but unfortunately they live a long way away. 13) What writing project are you working on now? I am a bit superstitious about announcing projects in advance, but apart from the odd short story and poem that optimistically I send off for the odd competition, I am about to put together another book length experience, possible as a novel, possibly as non-fiction. I am not yet sure. It all depends if anyone buys A Little Book of Pleasures.